RADM Samuel P. De Bow, Jr. 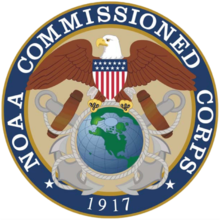 The National Oceanic and Atmospheric Administration Commissioned Officer Corps, known informally as the NOAA Corps, is one of seven federal uniformed services of the United States, and operates under the National Oceanic and Atmospheric Administration (NOAA), a scientific agency overseen by the Department of Commerce. The NOAA Corps is made up of scientifically and technically trained officers and is the smallest of the U.S. uniformed services. It is one of only two––the other being the United States Public Health Service Commissioned Corps––that consists only of commissioned officers, with no enlisted or warrant officer ranks. The NOAA Corps was established in 1970, though its origins in its predecessor organizations date back to 22 May 1917. It is the successor to the United States Coast and Geodetic Survey Corps (1917–1965) and the United States Environmental Science Services Administration Commissioned Officer Corps (ESSA Corps) (1965–1970). The NOAA Corps is the smallest of the seven uniformed services of the United States Government. [note 1] It has over 300 commissioned officers, but no enlisted or warrant officer personnel. The NOAA Corps today provides a cadre of professionals trained in engineering, earth sciences, oceanography, meteorology, fisheries science, and other related disciplines. NOAA Corps officers operate NOAA ships, fly NOAA aircraft, manage research projects, conduct diving operations, and serve in staff positions throughout NOAA, as well as in positions in the United States Merchant Marine, United States Department of Defense, the United States Coast Guard, the National Aeronautics and Space Administration, and the United States Department of State. Like its predecessors, the Coast and Geodetic Survey Corps and the ESSA Corps, the NOAA Corps provides a ready source of technically skilled officers which can be incorporated into the U.S. Armed Forces in time of war, and in peacetime supports defense requirements in addition to its purely non-military scientific projects. While civilian personnel could perform many of its functions, the advantage of the NOAA Corps as a commissioned service is the quick response time of its personnel, which NOAA can shift among projects and to various places around the world as the need arises more quickly and more easily than it could by reassigning or hiring civilian personnel to meet new or changing requirements. The NOAA Commissioned Officer Corps traces its roots to the United States Coast and Geodetic Survey. The Coast and Geodetic Survey's predecessor, the United States Survey of the Coast – renamed the United States Coast Survey in 1836 – was founded in 1807 under President Thomas Jefferson. Until the American Civil War, the Coast Survey was manned by civilian personnel working with United States Army and United States Navy officers. During the Civil War (1861–1865), Army officers were withdrawn from Coast Survey duty, never to return, while all but two Navy officers also were withdrawn from Coast Survey service for the duration of the war. Since most men of the Survey had Union sympathies, most stayed on with the Survey rather than resigning to serve the Confederate States of America; their work shifted in emphasis to support of the U.S. Navy and Union Army, and these Coast Surveyors are the professional ancestors of today's NOAA Corps. Those Coast Surveyors supporting the Union Army were given assimilated military rank while attached to a specific command, but those supporting the U.S. Navy operated as civilians and ran the risk of being executed as spies if captured by the Confederates while working in support of Union forces. After the war, U.S. Navy officers returned to duty with the Coast Survey, which was given authority over geodetic activities in the interior of the United States in 1871, and was subsequently renamed the United States Coast and Geodetic Survey in 1878. With the outbreak of the Spanish–American War in April 1898, the Navy again withdrew all of its officers from Coast and Geodetic Survey assignments. They returned after the war ended in August 1898, but the system of U.S. Navy officers and men crewing the Survey's ships that had prevailed for most of the 19th century came to an end when the appropriation law––approved on June 6, 1900––provided for "all necessary employees to man and equip the vessels," instead of Navy personnel. The law took effect on July 1, 1900; at that point, all Navy personnel assigned to the Survey's ships remained aboard until the first call at each ship's home port, where they transferred off, with the Survey reimbursing the Navy for their pay accrued after July 1, 1900. From July 1900, the Coast and Geodetic Survey continued as an entirely civilian-manned organization until after the United States entered World War I in April 1917. To avoid the dangers that Coast Survey personnel had faced during the Civil War of being executed as spies if captured by the enemy, the United States Coast and Geodetic Survey Corps was established on 22 May 1917, giving Coast and Geodetic Survey officers a commissioned status so that under the laws of war, they could not be executed as spies if they were captured while serving as surveyors on a battlefield during World War I. The creation of the Coast and Geodetic Survey Corps also ensured that in wartime a set of officers with technical skills in surveying could be assimilated rapidly into the United States armed forces so that their skills could be employed in military and naval work essential to the war effort. Before World War I ended in November 1918, over half of all Coast and Geodetic Survey Corps officers had served in the U.S. Army, U.S. Navy, or United States Marine Corps, performing duty as artillery orienteering officers, as minelaying officers in the North Sea (where they were involved in the laying of the North Sea Mine Barrage), as navigators aboard troop transports, as intelligence officers, and as officers on the staff of American Expeditionary Force commanding officer General John "Black Jack" Pershing. The Coast and Geodetic Survey Corps returned to peacetime scientific pursuits after the war. Its first flag officer was Rear Admiral Raymond S. Patton, who was promoted from captain to rear admiral in 1936. When the United States entered World War II in December 1941, the Coast and Geodetic Survey Corps again suspended its peacetime activities to support the war effort, often seeing front-line service. Over half of all Coast and Geodetic Survey officers were transferred to the U.S. Army, U.S. Navy, U.S. Marine Corps, or United States Army Air Forces, seeing duty in North Africa, Europe, the Pacific, and the defense of North America as artillery surveyors, hydrographers, amphibious engineers, beachmasters (i.e., directors of disembarkation), instructors at service schools, and in a wide variety of technical positions. They also served as reconnaissance surveyors for a worldwide aeronautical charting effort, and a Coast and Geodetic Survey officer was the first commanding officer of the Army Air Forces Aeronautical Chart Plant at St. Louis, Missouri. Three officers who remained in Coast and Geodetic Survey service were killed during the war, as were eleven other Survey personnel. After the war ended in August 1945, the Coast and Geodetic Survey again returned to peacetime scientific duties, although a significant amount of its work in succeeding years was related to support of military and naval requirements during the Cold War. The seal of the ESSA Corps, a predecessor of the NOAA Corps that existed from 1965 to 1970. When the Coast and Geodetic Survey was transferred to the newly established Environmental Science Services Administration on July 13, 1965, control of the corps was transferred from the Coast and Geodetic Survey to ESSA itself, and accordingly, the corps was redesignated the United States Environmental Science Services Administration Commissioned Officer Corps, known informally as the ESSA Corps. The ESSA Corps retained the responsibility of providing commissioned officers to operate the Coast and Geodetic Survey's ships and of providing a set of officers with technical skills in surveying for incorporation into the U.S. armed forces during wartime. Following the establishment of the ESSA, Rear Admiral H. Arnold Karo was promoted to vice admiral in order to help lead the agency. He served as the first Deputy Administrator of ESSA and was the first vice admiral, and at the time the highest-ranking officer, in the combined history of the Coast and Geodetic Survey Corps and ESSA Corps. Rear Admiral James C. Tison, Jr. was the first director of the ESSA Corps. The ESSA was reorganized and expanded to become the new National Oceanic and Atmospheric Administration on October 3, 1970. As a result, the ESSA Corps was redesignated the National Oceanic and Atmospheric Administration Commissioned Officer Corps, known informally as the NOAA Corps. Rear Admiral Harley D. Nygren was appointed as the first director of the new NOAA Corps. In 1972, the NOAA Corps became the first uniformed service of the U.S. Government to recruit women on the same basis as men. On June 1, 2012, the NOAA research vessel RV Gloria Michelle, a boat manned by two NOAA Corps personnel, became the first vessel in the history of NOAA (or its ancestor organizations) to have an all-female crew. Ernest Lester Jones 1917–1929 Superintendent (title changed to "Director" in 1919) of the U.S. Coast and Geodetic Survey from 1915 until his death in 1929. As such, led the Coast and Geodetic Survey Corps from its creation in 1917 until 1929. Was a colonel and intelligence officer in the U.S. Army during World War I.
rear admiral Raymond Stanton Patton 1929–1937 Director, U.S. Coast and Geodetic Survey, which included leadership of the Coast and Geodetic Survey Corps, from 1929 until his death in 1937. Became first flag officer in Coast and Geodetic Survey Corps history upon promotion to rear admiral in 1936. Rear admiral Leo Otis Colbert 1938–1950 Director, U.S. Coast and Geodetic Survey, from 1938 to 1950, which included leadership of the Coast and Geodetic Survey Corps. Rear admiral Robert Francis Anthony Studds 1950–1955 Director, U.S. Coast and Geodetic Survey, from 1950 to 1955, which included leadership of the Coast and Geodetic Survey Corps. Rear admiral Henry Arnold Karo 1955–1965 Last Director, Coast and Geodetic Survey Corps (1955–1965); simultaneously served as Director of the Coast and Geodetic Survey. At end of tour as Director, simultaneously transferred to new ESSA Corps and received promotion to vice admiral on 13 July 1965 to serve as Deputy Administrator, Environmental Science Services Administration (ESSA), from 1965 to 1967. The first officer in the combined history of the Coast and Geodetic Survey Corps and ESSA Corps officer to achieve the rank of vice admiral. Rear admiral James C. Tison, Jr. 1965–1968 First Director, ESSA Corps. Served simultaneously as Director, U.S. Coast and Geodetic Survey (1965–1968). Rear admiral Don A. Jones 1968–1970 Last Director, ESSA Corps. Served simultaneously as last Director, U.S. Coast and Geodetic Survey (1968–1970). Then served in NOAA Commissioned Officer Corps and was Director, National Ocean Survey, from 1970 to 1972. Rear admiral Evelyn J. Fields 1999–2003 First woman and first African-American in the combined history of the Coast and Geodetic Survey Corps, ESSA Corps, and NOAA Corps to serve as director. Rear admiral Michael S. Devany 2012–2014 Promoted to vice admiral on 2 January 2014, only the second officer to achieve that rank in the combined history of the Coast and Geodetic Survey Corps, ESSA Corps, and NOAA Corps, and the first to do so since Vice Admiral Karo in 1965. After tour as Director, became Deputy Under Secretary for Operations, NOAA. The NOAA Corps uses the same commissioned officer ranks as the U.S. Navy and U.S. Coast Guard. While the grade of admiral has been established as a rank in the NOAA Corps, the rank has not been authorized for use by the United States Congress. Current NOAA Corps ranks rise from ensign to vice admiral, pay grades O-1 through O-9 respectively. NOAA Corps officers are appointed via direct commission and receive the same pay as other members of the uniformed services. They cannot hold a dual commission with another service, but inter-service transfers are sometimes permitted. NOAA commissioned officers can be militarized by the President. The President may, whenever in the judgment of the President a sufficient national emergency exists, transfer to the service and jurisdiction of a military department such vessels, equipment, stations, and officers of the Administration as the President considers to be in the best interest of the country. An officer of the Administration transferred under this section, shall, while under the jurisdiction of a military department, have proper military status and shall be subject to the laws, regulations, and orders for the government of the Army, Navy, or Air Force, as the case may be, insofar as the same may be applicable to persons whose retention permanently in the military service of the United States is not contemplated by law. For formal service uniforms, the NOAA Corps wears the same Service Dress Blues and Service Dress Whites as the U.S. Navy, but with NOAA Corps insignia in place of U.S. Navy insignia. For daily work uniforms, the NOAA Corps wears the same Operational Dress Uniform (ODU) as the U.S. Coast Guard, but with NOAA Corps insignia in place of U.S. Coast Guard insignia. ^ The other six uniformed services of the United States government are the United States Air Force, United States Army, United States Coast Guard, United States Marine Corps, United States Navy, and United States Public Health Service Commissioned Corps. ^ "33 USC 3005: Number of Authorized Commissioned Officers". ^ "Forward With NOAA (NOAA Corps Song) - Office of Marine and Aviation Operations". ^ "NOAA History A Sea Odyssey". ^ "History of the NOAA Corps". Archived from the original on August 25, 2009. ^ "The Roots of the NOAA Corps". ^ a b Rensberger, Boyce; Rensberger, Boyce (September 10, 1986). "The Few, the Proud -- the NOAA?" – via washingtonpost.com. ^ a b c d e f g "NOAA History /NOAA Legacy/NOAA Corps and the Coast and Geodetic Survey". ^ "NOAA History - NOAA Legacy Timeline - 1800's". ^ U.S. Coast and Geodetic Survey (1901). Report Of The Superintendent of the Coast And Geodetic Survey Showing The Progress Of Work From July 1, 1900 To June 30, 1901. Washington, D.C.: U.S. Government Printing Office. pp. 15, 17, 109. ^ "NOAA History - NOAA Legacy/Historic Documents - Reorg Plan Establishing ESSA Under Dept. of Commerce". ^ Reorganization Plan No. 4 of 1970, reprinted with amendments in 5 U.S.C. app. at 1557–61. Section 3(d) states: "The Commissioned Officer Corps of the Environmental Science Services Administration shall become the Commissioned Officer Corps of the National Oceanic and Atmospheric Administration." ^ "NOAA History - NOAA Legacy Timeline - 1970-2000". ^ teehan, sean. "NOAA ship leaves Woods Hole with first all-female crew". ^ Hefler, Janet (June 6, 2012). "Lt. Anna-Liza Villard-Howe takes command of NOAA research vessel". ^ a b c d e f g "Leaders of Coast Survey" (PDF). National Oceanic and Atmospheric Administration. Retrieved August 29, 2013. ^ "C&GS Biographies". Profiles in Time NOAA History. National Oceanic and Atmospheric Administration. Retrieved 29 August 2013. ^ "Jimmy Carter: National Oceanic and Atmospheric Administration Nomination of Capt. Kelly E. Taggart To Be Director of the Commissioned Officer Corps". ^ "Ronald Reagan: Nomination of Rear admiral Francis D. Moran To Be Director of the Commissioned Officer Corps of the National Oceanic and Atmospheric Administration". ^ "Nation's Smallest Service to Get New Leader". ^ "Rear admiral William Stubblefield Confirmed By Senate As Director Of Office Of NOAA Corps Operations". Archived from the original on August 6, 2013. ^ "Rear admiral Evelyn J. Fields Formally Assumes Command of Office of NOAA Corps Operations and NOAA Commissioned Corps". Archived from the original on February 12, 2008. ^ "President Bush Appoints Rear admiral Samuel P. De DeBow Jr. to Mississippi River Commission". Archived from the original on June 15, 2010. ^ "Vice Adm. Devany named NOAA Deputy Under Secretary". ^ "RADM Michael S. Devany, NOAA Director, NOAA Commissioned Officer Corps Director, NOAA Office of Marine and Aviation Operations" (PDF). US Department of Commerce, National Oceanic and Atmospheric Administration. Archived from the original (PDF) on February 15, 2013. Retrieved January 10, 2014. ^ "Rear Adm. David A. Score to lead NOAA Corps and Office of Marine and Aviation Operations". US Department of Commerce, National Oceanic and Atmospheric Administration. Retrieved January 10, 2014. ^ "Michael Silah to lead NOAA Corps and Office of Marine and Aviation Operations". US Department of Commerce, National Oceanic and Atmospheric Administration. Retrieved September 3, 2017. ^ Note: This rank is currently not in use.